Get this Action packed Promotional Ultra HD 4K WiFi Action Camera with Dual Screens fully packed with amazing features from storage to quality pictures and videos and with the bonus of dual screen. This corporate give away will take the extraordinary at the palm of your hands. Best moments are worth capturing! This amazing corporate give away is certainly what your clients needed to capture their best moments with your company. 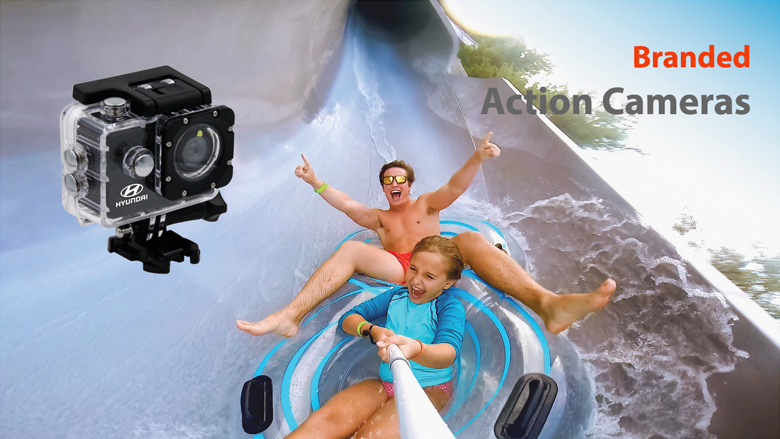 Share them your amazing stories in clear 4K Ultra high definition with this Personalized 4K Ultra HD WiFi Action camera. It only awaits your logo. Customize this Promotional Action Camera 1080P Full HD with your logo; reward your customers and employees with this wonderful gift. Truly your choice of promotional gift that is suitable for any occasion, sports and day to day activities the merits wonderful moments. Now, you can make your clients and employees excited by gifting them this Branded 360-degree Panoramic Action Camera, which can be easily customized with your brand name and logo. Branded Full HD 1080 Wi-Fi Action Camera is provided with ample printable area to imprint your brand name and logo. It is a perfect corporate gift for patrons, which they will definitely adore. They can make clear videos with video recording resolution of 1080P, 30FPS, 720P, and 60FPS. If your promotional campaign for your business is in need of a product that can become the perfect corporate gift for your clients, then look no further than the VGA Action Camera! With a trendy look and functionality at its peak, it will be a favorite amongst the masses and advertise your business perfectly.